Who is it for? St D’vence Body Lotion Autumn Edition is a completely vegetarian moisturizer is for dry skin that provides heavy moisturization all day long. Gently massage it into skin using fingertips. 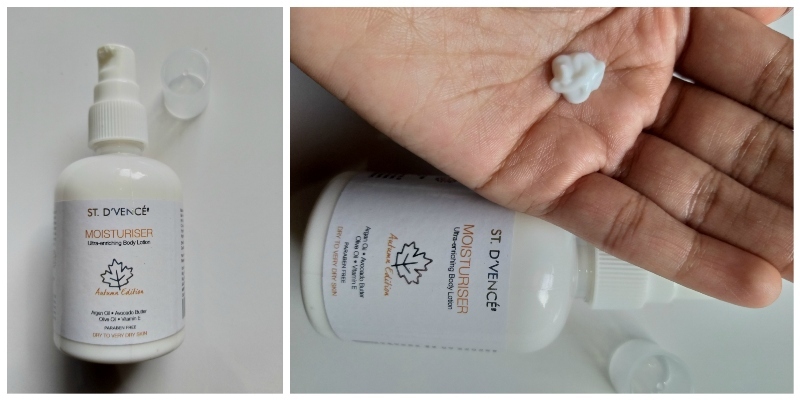 This moisturizer comes in a really cute pump plastic bottle that is transparent. The pump packaging makes it really convenient to apply the moisturizer. I loved the cute little packaging. It is milky white in color and soft in texture. The consistency is not too thick nor too thin, it has a perfect consistency. The fragrance is mild and really good. This product is 100% vegetarian. It is paraben free, cruelty-free, mineral oil free, phthalates free, peg and pg free and contains no harmful chemicals. I had really dry skin but this moisturizer worked wonders on my skin and provided heavy moisturization all day long. You do not need to reapply this, it provides heavy moisture all day long. It does not feel sticky on the skin, it feels very lightweight. It gets absorbed into the skin easily. I even used this on my face and it felt really good, didn’t break me out and made my skin soft. This product is worth its price. Parabens free, mineral oil free, phthalates free, peg and pg free, cruelty-free and contains no harmful chemicals. Has the cutest and most convenient pump packaging. I absolutely loved this moisturizer and would definitely recommend this to everybody. I’m looking forward to trying all the other variants of this moisturizer.